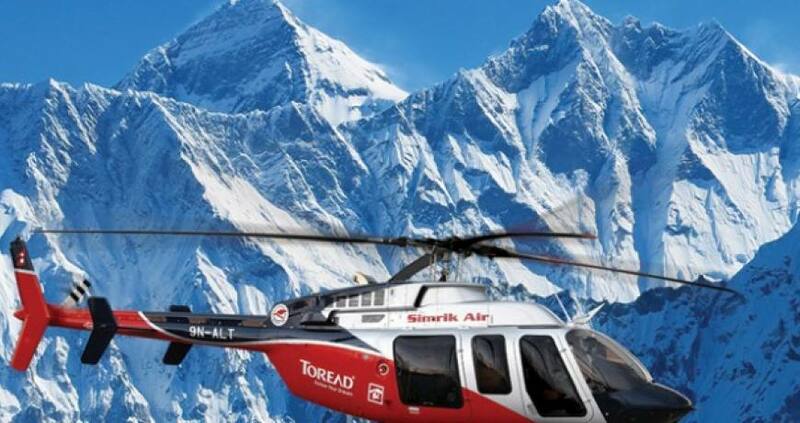 Everest base camp helicopter flight landing tour is an alternative way to be on the foot of towering world highest Mt. Everest overlooking tumbling great block of ice and glaciers of notorious Khumbu Ice Falls at mere distance with other mighty giant peaks. This is the best way for travelers and visitors with dreams to be closest to Mt. Everest by helicopter Flight to Everest Base Camp in short duration of time within few hours flying to and from Kathmandu. Although its an expensive and luxury trip but worth every minute where you will be rewarded with fantastic views of Himalayan mountain range from the start to an end during our breathtaking helicopter Flight to Everest Camp where you will marvel panoromic landscapes of Nepal, verdant valley-green rolling hills dotted with farm villages and well tended terraces in the backdrop of tall Himalayan Mountains. Everest base camp helicopter flight landing tour, leads you above Kathmandu valley and swirls around to land at Lukla airstrip for short moment where you can observe first glimpse of Sherpa culture and traditional way of life intact with Buddhism religion. Day 01: One Day activities of Mount Everest Base Camp Helicopter tour: join group to minimize the Everest helicopter tour package or private flights. Applicable Permit arrangement service only (Fees extra). Service of guides his / her daily wages-medical insurance, meals and transportation allowance. Expenses of personal nature and meals in Kathmandu and Everest, gratitude (tips), hard / soft drinks throughout the day trip. Day 01One Day activities of Mount Everest Base Camp Helicopter tour: join group to minimize the Everest helicopter tour package or private flights.1) Starting early depart (6:30 AM) from the hotel for the transfer to Kathmandu domestic air terminal for super scenic panoramic flight, the seats with much space for leg rooms with large window seating where you can marvel immense scenery. 2) After getting in the chopper, where captain might have co-pilot sometimes depending upon the size of the group, with only one pilot where you can have the honor seating next to the pilot also with commanding views that faces ahead. 3) After a seating arrangement flying over Kathmandu valley catching views of Ganesh-Manaslu-Langtang and Jugal Himal range of peaks with Gaurishanker and Melung Tse peaks. 4) As the flight swirls above rolling green hills past Dolkha village around Jiri village heading past Lamjura-la pass of 3,550 m high covered in thick alpine forest of rhododendron-magnolia-pines and oaks trees, our air journey continues after half hour to 45 minutes from the take off. 5) To land at Lukla with awesome views of Himalayan chain of mountains with Mt. Everest during the flight and then landing at Lukla unique airstrip known as Tenzing & Hillary airport tribute to the legendary mountaineers who first conquered Mt. Everest in May 29th 1953. 6) At Lukla where chopper lands for refueling as well for refreshment in its many excellent lodge with fine restaurants and bakeries, here with time to observe the local Sherpa traditional life interwoven with Buddhism teaching. 7) Lukla at an altitude of 2,820 m. high, which is also a door to many Everest trekking-mountaineering and other adventure to cultural walks, from Lukla after half hour stops then flying high into Dudh Kosi River gorge in between the peaks of Kwangde and Kusumkanguru with Tharmarserku peaks, as the chopper whirls heading at Namche Bazaar. 8) At Namche a short fly over to glimpse the view of famous colorful Namche Bazaar where busy Saturday Market takes place every week, Namche the hub and main Sherpa capital of Khumbu region within Everest. 9) From Namche heading higher with awesome panorama of snow peaks with Mt. Everest and majestic Amadablam peaks and then landing (only special flights with extra cost) at scenic Thyangboche near its famous old Buddhist monastery. 10) A charming spot surrounded by snow capped peaks with close views of Amadablam- Everest and other peaks, located within green forest. 11) With time to visit its famous monastery where you can observe monks and priest in prayer halls, here most of the climbers and mountaineers receives blessing from high priest for safe and successful climb on Everest and other high peaks. 12) From Thyangboche after two hours of great flight continue towards Mt. Everest Base Camp above beautiful Khumbu valley surrounded with world highest peaks and then landing at Kalapather Gorakshep of above 5,180 m high, this was once an original base camp earlier from 1950′ to late 1960’s located beneath lofty peak of Pumori and Kalapathar rocky view point hill. 13) After a brief stop fly towards Everest Base Camp above moraine and ice to reach at base camp, here enjoy the view of tumbling and notorious Khumbu Ice Fall and glaciers. 14) After a marvelous and exciting time with adventure of a lifetime experience retrace the air journey back to Kathmandu with awesome and memorable time on Helicopter flight to mt. Everest Base Camp. The Flying hours and brief stop over totally depends upon the weather and pilots decision, whether it’s perfect for stops and landing at villages or at Everest base camp, as the Himalayan weather can be unpredictable sometimes during late afternoon times. 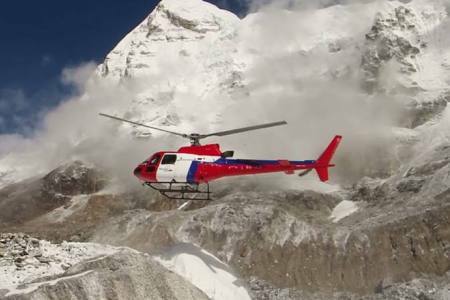 Areas of Everest helicopter tour : Over Everest base camp, Solu and Khumbu areas of Nepal's North East Himalaya region. 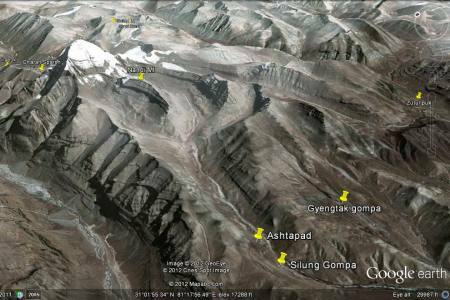 Highest Altitude gain on stops: 5,364 m at Everest Base Camp / Kalapather and 5,180 at Gorakshep.